McDonald’s fans are rejoicing after the fast-food chain announced the highly-anticipated return of a cult-favourite menu item. The beloved McRib, a sandwich stuffed with a boneless pork patty covered in “tangy, delicious” barbecue sauce, pickles and onions, will officially be returning to stores on Monday October 29, the chain announced – and some stores already have it. “We know our fans love this limited time classic,” McDonald’s chef Mike Haracz said in a statement today. 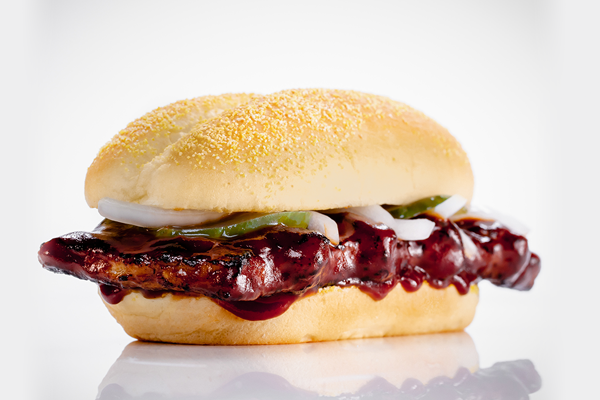 The McRib, which was first released 36 years ago, is available for a short time only each year. However, fans of the BBQ sandwich often struggle to find it – as restaurant participation is up to each individual restaurant. Fortunately, this year, McDonald’s announced that it would be making some changes so the McRib is more easily-accessible to all. If that weren’t convenient enough, the global fast-food chain has also partnered with Uber Eats to make “McDelivery” a reality. McDonald’s Next has what is calls a “Real & Fresh” theme. The open-plan design of the shop front, kitchen, transparent “theatre” kitchen and McCafé allows customers to view food preparation. McDonald’s Next incorporates glass extensively throughout its design. A new Self Ordering Kiosk allows customers to build their own Salad or Burger. McDonald’s Next offers table service every night after 6pm. 19 ingredients are available for selection in Salads, including two choices of salad greens, two kinds of cheese, three flavours of sauces and a plethora of other ingredients. Customers can also select grilled chicken, crayfish egg mayo and quinoa cous-cous mix to go with the salad. The news has been met with joy on social media, where McRib-lovers have begun celebrating. “I don’t mean to alarm anyone, but THE MCRIB IS BACK,” one person tweeted. Another said: “The McRib is back and I’ve never been happier. Currently, the McRib is only available in 9,000 of the more than 14,000 US McDonald’s locations, excluding Alaska, Hawaii, and US territories.